The fired deputy director of the FBI, Andrew McCabe, is accusing his former agency of potentially targeting him unfairly by stalling publication of his much-anticipated book, "The Threat: How the FBI Protects America in the Age of Terror and Trump." Based on FBI policy requiring that the FBI have an opportunity to review agency-related information before it's released publicly, McCabe submitted a draft of his book to the FBI more than two months ago, and the book was set to be published in early December. But the FBI has yet to reach a conclusion on McCabe's proposed revelations, so the book's publication date has now been pushed back to February 2019, according to McCabe. 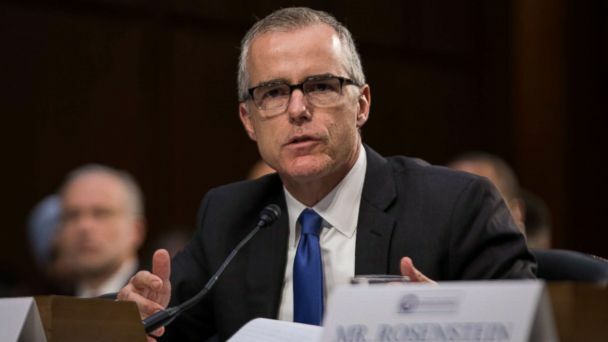 "I am disappointed that we have had to substantially delay the publication date for my book because the FBI's review has taken far longer than they led me to believe it would," McCabe said in a statement to ABC News. "Having been singled out for irregular, unfair treatment over the past year, I am concerned that it could be happening again." A source familiar with the matter -- an associate of McCabe who was not authorized to speak on the record -- said McCabe's team and FBI officials have exchanged "countless calls and emails," but there is still "zero clarity" about what the source described as a review that "has gone outside of the norms and protocol of pre-publication review." FBI policy states that in order "to protect national security and ensure the effective enforcement of federal laws," FBI personnel must submit "any proposed disclosure of FBI information" to the agency for approval. Pre-publication review "in general" is completed within 30 business days, but "additional time may be necessary for sensitive, voluminous, or technical submissions," and, "When a submission contains operational or intelligence matters, it is unrealistic to assume the proposed disclosure will be reviewed within 30 business days," according to an FBI policy guide posted online. McCabe's former boss, James Comey, announced in November last year that he would be releasing a book, which was then published in late April, nearly six months later. McCabe's book was announced last month, and now it's expected to be published five months later. Nevertheless, the FBI policy guide states, "If the review requires additional additional time, [the FBI] will provide periodic progress reports and will advise the submitter of the anticipated completion date." McCabe has not been advised of an anticipated completion date, according to the source familiar with the matter. But in his statement to ABC News, McCabe said, "I am looking forward to sharing my story with the public, and now look forward to doing so in February." The source familiar with the matter raised the specter that politics could be at play, saying McCabe's team is "concerned that the book delay is due to political anxiety" over recent news reports disclosing that McCabe kept notes of a Justice Department meeting last year in which Deputy Attorney General Rod Rosenstein mentioned the possibility of secretly recording President Donald Trump or trying to remove him from office. The FBI declined to comment on the suggestion that politics could be holding up McCabe's book, and the agency also declined to comment on the review process at all. The Justice Department did not immediately respond to a request for comment. In recent weeks, Rosenstein's tenure at the Justice Department has appeared to be in peril, but after speaking with Rosenstein earlier this week, Trump insisted the pair "actually get along" and said he was not planning to fire Rosenstein anytime soon. Three weeks ago, the New York Times first reported that at a May 2017 meeting between Rosenstein and then acting-FBI director McCabe, Rosenstein suggested that someone wear a wire when speaking with the president, according to memos McCabe made of the conversation, sources familiar with them told ABC News. During the meeting, Rosenstein also raised the possibility of using the 25th Amendment to remove Trump from office, two sources familiar with the meeting said. The meeting took place a week after Trump fired James Comey as director of the FBI. In a second meeting later in the day, with others present including then-FBI attorney Lisa Page, Rosenstein again raised the idea of putting a wire on someone to record Trump, the sources said. Some in the room left the meeting believing he was joking about the wire idea, but McCabe and Page left the room thinking otherwise, according to the sources. After news reports of McCabe's memos first surfaced, Rosenstein issued a statement saying, "I never pursued or authorized recording the President and any suggestion that I have ever advocated for the removal of the President is absolutely false." At the time, McCabe's attorneys issued a statement acknowledging that McCabe "drafted memos to memorialize significant discussions he had with high-level officials," adding that McCabe preserved the memos "so he would have an accurate, contemporaneous record of those discussions." McCabe's attorneys also said that McCabe gave "all of his memos" to Special Counsel Robert Mueller last year, but McCabe "has no knowledge of how any member of the media obtained those memos." McCabe was fired from the FBI in March after the Justice Department's inspector general concluded that McCabe misled investigators looking into how Justice Department and FBI officials handled matters associated with the 2016 presidential election. McCabe has defended his actions, insisting he did his best to relay accurate information to those investigators. Trump has often attacked McCabe as emblematic of political bias within the FBI. In a statement issued when his upcoming book was first announced, McCabe said, "I wrote this book because the president's attacks on me symbolize his destructive effect on the country as a whole. He is undermining America's safety and security, and eroding public confidence in its institutions. His attacks on the most crucial institutions of government, and on the professionals who serve within them, should make every American stand up and take notice." At the time, McCabe's publisher, St. Martin's Press, said it expected McCabe's book "to be a seminal record of our times."